My hands are itching to do some baking. I've not baked in my oven for more than a week! The days have been really very busy since last week. This week, the days are equally bad. My days are filled with meetings that lasted till later than my office hours. By the time I reached home, it was late already. Cannot take it any longer, I decided to do some simple baking this evening, even though I was home much later than usual. 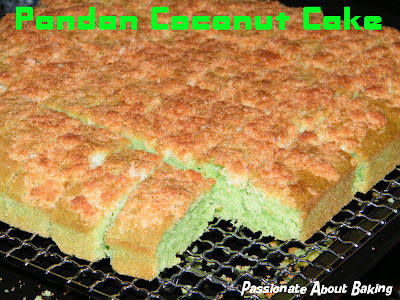 Pulling out Alex Goh's Creative Making of Cakes, I've decided to bake Pandan Coconut Cake, just to satisfy my craving for bakings. 1. Cream (A) till light and fluffy. 2. Add (B) a little at a time and cream till smooth and light. 3. Fold in (C) and mix till well blended. 5. Mix all the ingredients of topping and sprinkle on top of the cake. 6. Bake at 175C for 45mins. 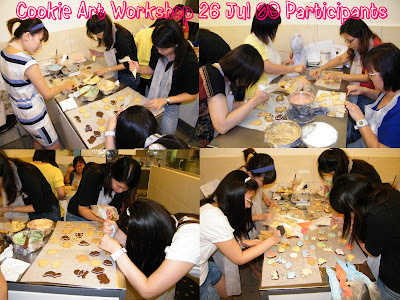 The time has arrived...for my first workshop- Cookie Art Workshop @ Sugar Inc. I've been preparing myself for this day to start my workshop. I was rather nervous on that weekend. However, as I've prepared myself rather well, I was able to remain calmed and composed. Somehow, I think I have. Or at least, I thought I have. Heehee... Anyway, the workshop was rather smooth except for some very minor mishaps, which was under good control in no time. The fortunate thing was, there was no class after my workshop as my workshop had over-run! Good gracious! I think I must've been too long-winded and shared too much! Good? Not very I would think. By the time the participants left was an hour later. As I was busy helping the participants, I didn't have the time to capture them in action. 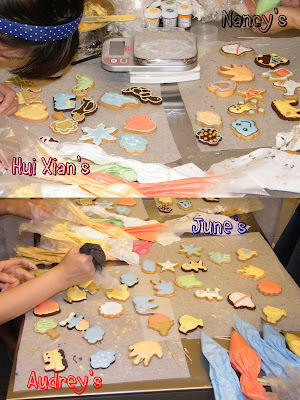 Only when they were decorating the cookies, then did I steal some time to catch them in action, after having done some washings on. This group of participants were very helpful as I conducted the demonstration, and were very eager to learn. 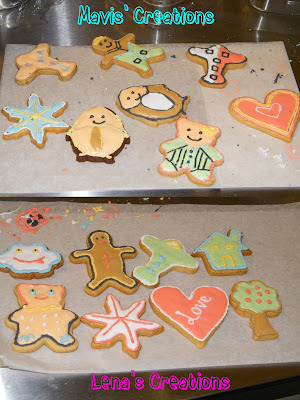 I must say, for first timers in royal icing decoration, they were pretty good! I hope they have found the workshop useful and learnt the correct techniques in baking the cookies, the royal icing preparation and the decoration. I had a good time sharing with them what I've learnt. If anyone is interested, there are still limited vacancies available, check out Sugar Inc Workshop Details for more information. The once-a-week baking workshop is really interesting. Last week, we baked the cheesecake. 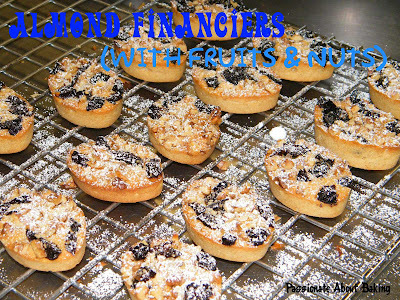 This week, we baked two items - Financiers and Rockies. For these two items, the bakings are quite straight forward. Therefore, there wasn't much theory, mostly follow the instructions and procedures. These were some of the steps. 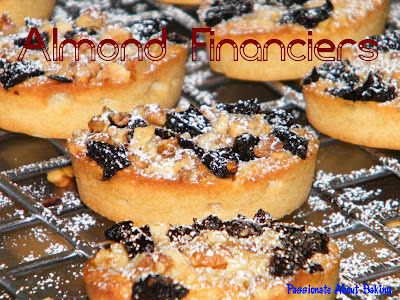 Almond Financiers with Fruits and Nuts. 2. The butter has to be browned. 3. Whisking the egg whites manually. 4. Egg whites is foaming, the stage that is required for the financiers. 5. Pour the egg whites into the flour, and mix thoroughly. 6. Add in the cooled butter and mix completely. 7. Scoop the batter into a piping bag to pipe into the mould. 8. Add prunes and walnuts on top, and press in lightly. These were my baked financiers sprinkled with icing sugar. We were given very pretty cookie bag to present our financiers. These were from another group of coursemates. 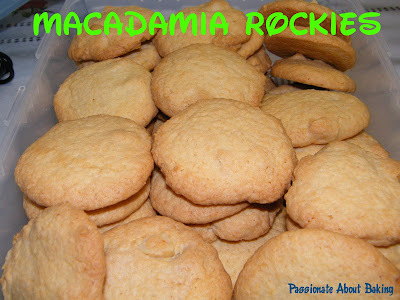 Macadamia rockies are actually cookies. It was actually very nice, but too big for our mouth! 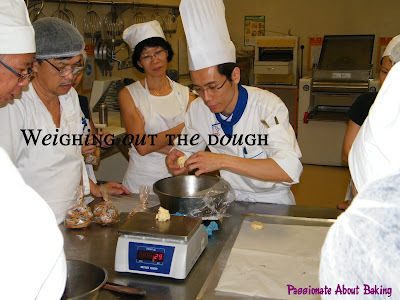 Our instructor, Mr. Lim, weighing out the dough to be 30g each. 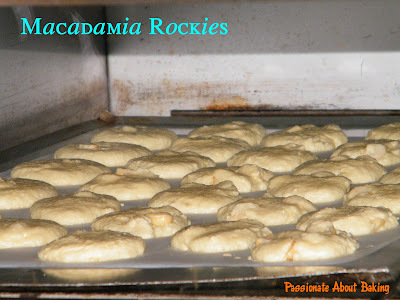 Baking my "rockies" in the oven. As I've shaped it too beautifully, it doesn't look rocky, but it does taste damned good! Lately, I haven't been updating on the wedding cake decoration workshop because we were just too busy preparing the cake before the grand assembling. I was too busy until I just have no time to take pictures. 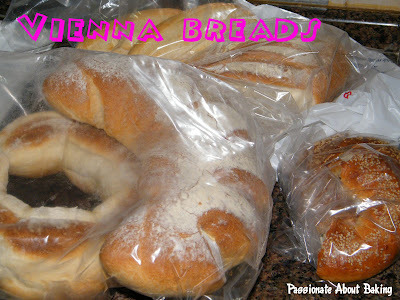 Anyway, on Friday, before we left, one instructor came over to our class and gave us bags of breads. It was "gave", not buy!! Otherwise usually, he will bring over loaves and loaves of white breads and we will buy from him. But this time, he was so nice to bring the breads and gave them to us! where nights are spent baking faves. where nights are spent in wedding cake decoration craze. if there is an eighth day? I would like to thank Small Small Baker for passing this wonderful award. I'm very honoured to receive this award. Okay, here's seven truth (not dare) about myself. 1. I enjoy close relationships with my parents, siblings and my family members. 2. A wonderful husband who always supports what I do. If he doesn't, that's because he has rationalise it first before he objects. 3. 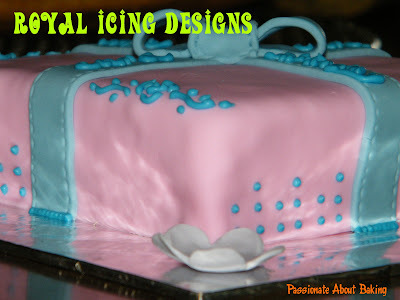 I love baking, and attending baking courses and workshops in order to learn the correct skills and techniques. 4. I have three very understanding children who will not disturb me when I'm doing my baking. A domestic helper who is all the help I need! 5. My dream is to have my own bakery which has a studio for training. 6. I'm very optimistic about life, and sees life in a lighter matter. I've learnt to let live and forgive. 7. I believe in fate, and in the Law of Attraction. Now, I'll like to pass this award to the following wonderful bloggers. 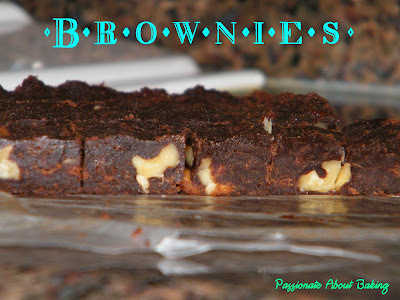 * Angie's-A wonderful lady who shares all her recipes and teaches the hows and whys. * Dreamers Loft-Someone who is talented both in paper and baking. * Eat and Be Happy-A young lady who has experienced a whole new world and bakes like a pro! * Wen's Delight-Someone I don't know, but I love visiting her blog to learn more. * Yuri's Bake-A very wonderful lady who shares with me what she knows personally. 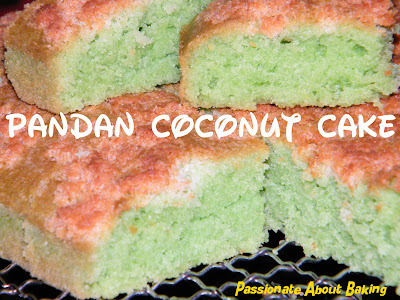 * Baking on Cloud 9-A wonderful lady who loves to bake, very much like me. * Daily Delicious-There's not a recipe in her blog that I'll miss printing it out. It's a blog, you'll just have to visit! 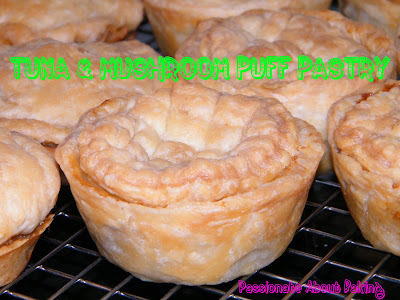 Last Sunday, my dear hubby suddenly had craving for chicken puff pies. We went to PH after lunch and when he saw the puff pastry sheet in the freezer, he asked if this needed to add ingredients to get chicken puff pies. I looked at him patiently (even though I wanted to ask him "What do you think?") 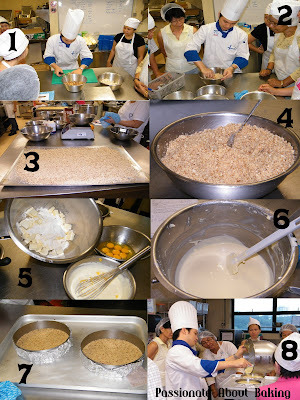 and said that this is only "THE SHEET", and that preparation of other ingredients is definitely needed. 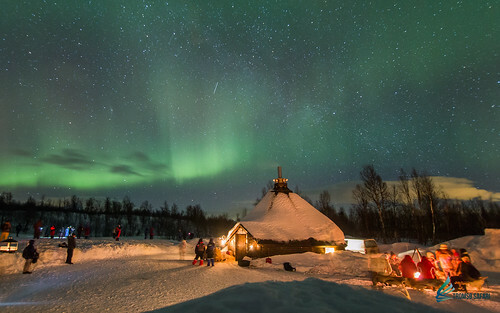 He nodded his head in understanding and placed it back to the freezer. Over the years, I've grown rather patient in general, and tried to stay composed. I've learnt not to be too impatient or mean, as I believe what goes around comes around. Furthermore, I've "seen through" already and take life in a lighter stride. Why make yourself unhappy with other people's actions/words or reactions. No point. Treat yourself well even if the whole world treats you badly. These are my beliefs. So today, while I had time on hand, I embarked on my puff pastry baking. I coaxed my hubby to buy chicken meat for me to bake chicken pies, but he refused. 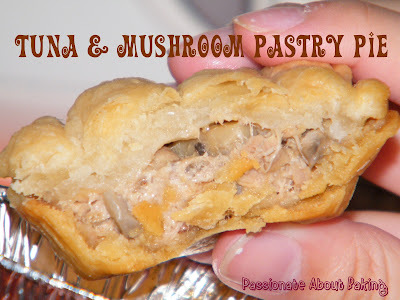 So I used tuna to replace chicken and made Tuna & Mushroom Puff Pastry Pies. 1. 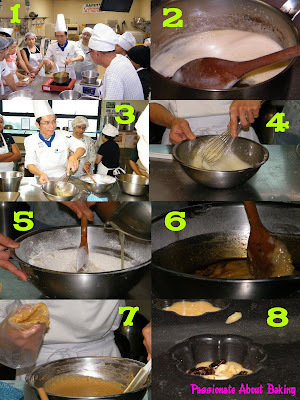 Preparation of the pies. Shortcrust base were used. 2. Baking the pies in the oven. 3. 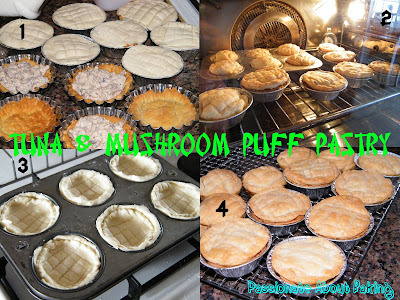 These lots were made using the puff pastry as the base and the cover, while the rest were using shortcrusts as base. 4. Baked puff pastry pies. 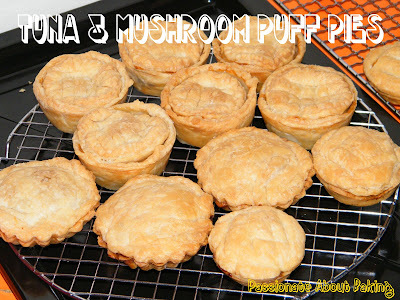 A mixture of pies of various sizes. This is the "full" puff pastry pie. My son was just too eager to have a piece of pie when he came back from school today. He persuaded me to let him have one. Since I made so many, might as well let him be my "taster". 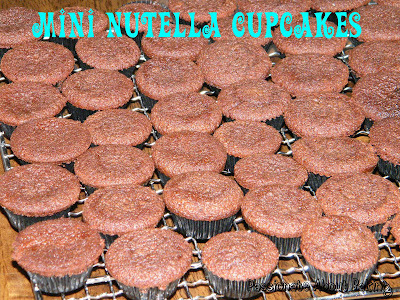 As I had time in the evening, I decided to bake the Nutella Cupcakes again. I found that there was a sales for the extra large Nutella in Fairprice now. It's going for $8.80 for a 750g, comes with a free small Nutella worth $3.70. Without hesitation, I quickly use my Nutella, so that I can buy again and stock up! Heehee... The recipe yields 72 mini cupcakes! Yummy. Good news to announce! My dear hubby took my oven to the service centre and got it repaired within two days! It was a pleasant surprise for me on Friday. Fortunately, the cost of the repair was not too exobitant! Boy, was I glad. I hadn't been updating much on my wedding cake decoration course. Mainly because I was still struggling with my designs. I've not even decided on the theme yet! Worst was, I was the slowest to cover the dummy cakes on Friday! It really gave me a lot of stressed over past two weeks. Sigh! A bit of regrets taking up this course. Life was actually quite smooth, wondered why I want to make it so "rough" myself. Having said that, all of us were just waiting for our own final presentation. Just wait and see. Life is a like box of assorted chocolates. You'll have to taste it to experience it. If you don't taste it, you won't know if you like it. Only when you have tasted it, then you can tell others of your experience. Many times, certain things just don't go our way. We got stressed, we got upset. But when we reflect about it, life just has a way of making it better for you! Actually, attending courses quite be quite addictive, at least for me. I've signed up for BITC's Certificate in California Style Baking. The course is about 4 hours over 4 weekends. I started my first workshop last Saturday. 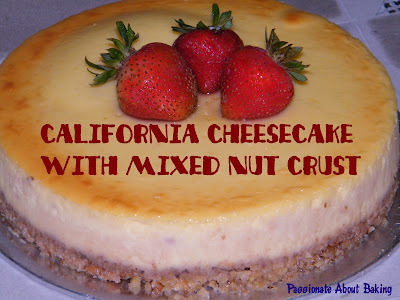 We started with the California Cheesecake with Mixed Nut Crust. 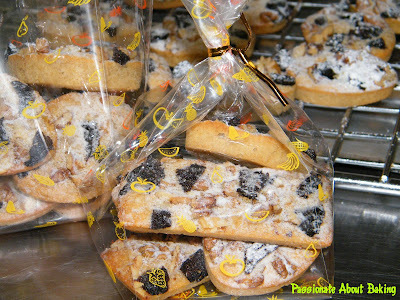 Subsequently, there are financiers, rockies, muffins, brownies and breads. Well, it's not that I don't know how to bake these, but I would like to understand the art and science of using these ingredients for the particular bakes. It's really interesting to learn. 1. Chopping up the walnuts and almonds. 2. Pressing the nuts together with the sugar and butter. 4. The nut base for the cheesecake. 5. Ingredients for the cream cheese fillings. 6. Well mixed cream cheese fillings. 8. Measuring the cream cheese fillings into the nuts base. 9. Steam bake the cheesecakes with elevation. 11. Transferring the cheesecake into the cake board. 12. Glazing the strawberry for decoration. This is my baked California cheesecake. 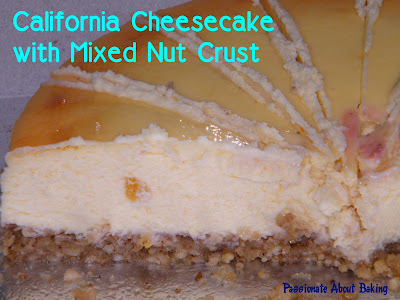 The cheesecake is really soft, creamy and nice, especially with the walnuts and almonds. The taste together was really good! So next time, instead of the normal digestive biscuits or sponge cake base, substitute them with the mixed nuts base. It really brings up the value of your cheesecake! 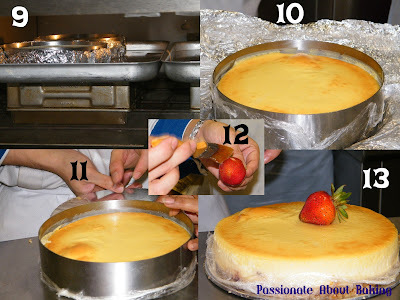 I'd like to share some tips with you on what I've learnt about cheesecakes. 1. Baked cheesecakes must be only 75-80% baked. If it's 100% baked, it will then be too dry. So how do you see if it's only 80% baked? You shake the cheesecake, if the centre is slightly wobbly, it means it's already 75-80% baked. 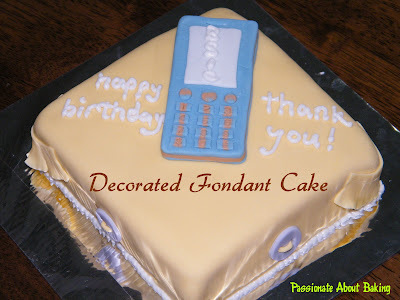 If the cake is firmed, then you would have overbaked it already! 2. Minimum decoration is required for cheesecakes. You can brush the top with apricot gel to give it a shiny look, then decorate it with some fruits. 3. Cream cheese contains some kind of "gum" that helps it to stay in "shape". It means that no matter how you beat it, it will not curdle. This is different for mascarpone cheese. 4. Water bath or steam bake is required for cheesecake. Hot water is used so that it expedite the steam in the baking. I hope we can all benefit from this few tips. Good luck in your cheesecake baking! Time just flies with a blink of the eyes. I realised that I've not been updating my blog for about 10days! It was quite unlike me to keep the interval so long. I think it's either age is catching up with me (can't multi-task anymore) or I've been too busy lately. I guess another factor was also that I've not been baking much lately because of other commitments. 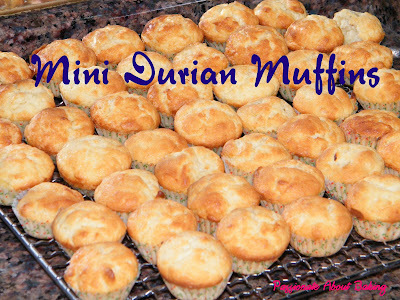 Anyway, I've just managed to finish another batch of durian-related food - durian muffins. The recipe was again, from Anna, which I had tried before previously. After a successful attempt, I'm tempted to try again of course! Who isn't motivated by successes? 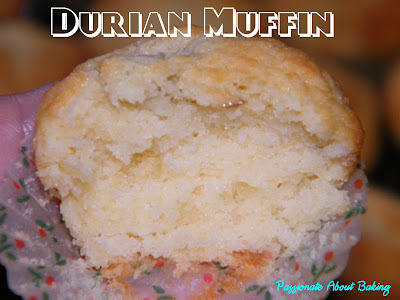 ;) I have all those leftover durians in the freezer, and I thought I'd better use them quickly before I forget again! And again, the texture turned out really nice. It was very fragrant too. However, there was a sad thing. I spoilt my oven! I don't think I will be able to bake until I've gotten it repaired/replaced!! I've been very rough in handling my oven, and I think it was her way of showing displeasure, so she has decided to quit on me! *boohoohoo* Until it's been repaired, till then baking! 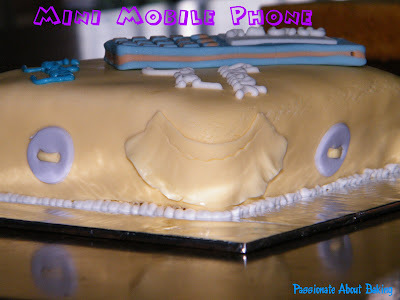 Just to share on my bakes for the past week. 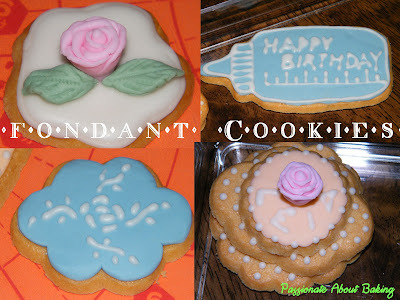 Made some fondant cookies as a gift for a friend's daughter birthday. 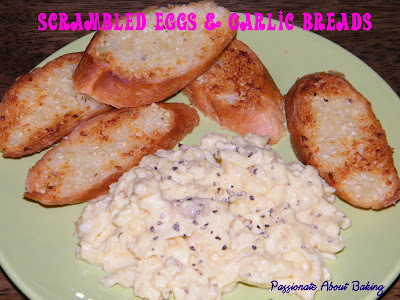 It was scrambled eggs and garlic toast for breakfast last Saturday. 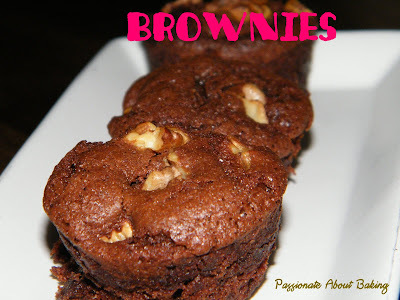 Try out a new Brownie recipe using Valrhona chocolates. Wasn't quite successful but I managed to salvage it! :p Will have to try this recipe again. 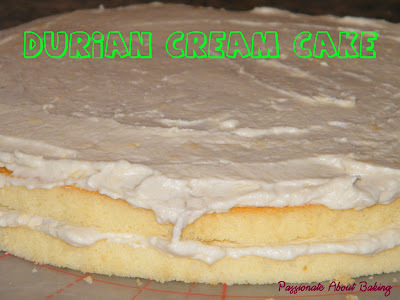 Did a durian cream cake for my sister-in-law last weekend. 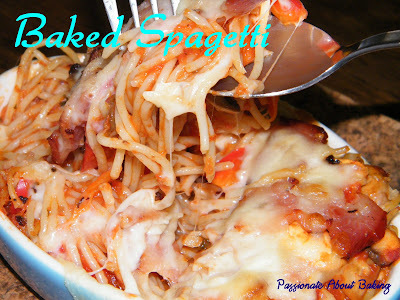 Finally, had baked spagetti for dinner yesterday. I love the mozzarella cheese on pasta/spagetti. I have also been very busy lately with my course. Had to practice my sugar paste flowers. I've still not decided on the design and the colour of my dummy wedding cake. Had been sourcing for the syrofoams and some other materials lately. It had been so stressful for me. 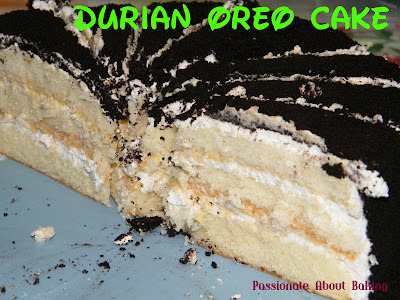 Some days back, I saw HHB posted her blog with this Durian Oreo Cake. I thought it was rather interesting. 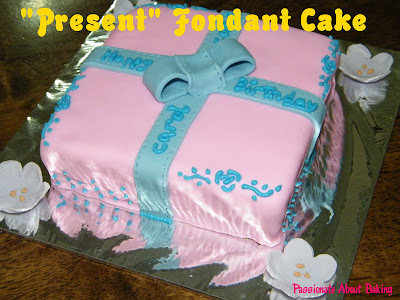 Actually I've seen this combination of cake before, but I didn't think much of it until she baked it. I've requested her for the recipe and she was generous and kind enough to post it up after receiving so many requests. Well, since I've requested for it, I'd better not waste her effort. So, picking up my courage, I tried to bake this cake. 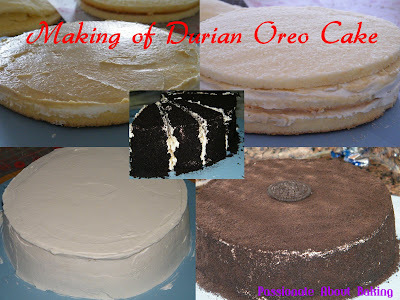 I knew I wanted to bake a durian cake, but was hesitant about adding oreo. Eventually, I did add the oreos. My failed attempt was baking the cake. Somehow, I still cannot fold in the flour without deflating the bubbles. In fact, I had to bake twice in a row, just so to get 3 layers of sponge. *sigh* Still trying to get the techniques of folding flour into aerated eggs right! Anyone there can coach me one-to-one please?? The batter just went flat and there was no difference in the level of the pan before and after baking! Hahaha... I saw how high the cake can rise in HHB's picture. Mine just refused! 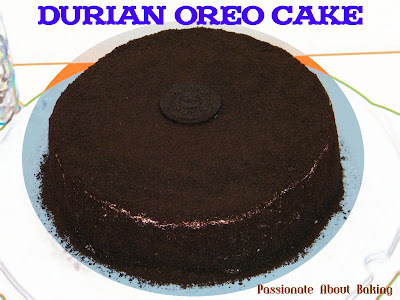 Anyway, the comments I received on the cake is - sponge is too dense (as expected), should have more durian pulps, otherwise, the overall taste is good. I used diary whipped cream instead of non-diary as I prefer the diary taste more. 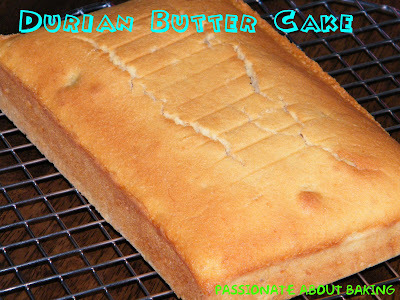 It's actually a very easy and simple recipe to do, except for the challenge of the sponge cake for me! I like this cake too! Some updates on my Wedding Cake Decoration course. 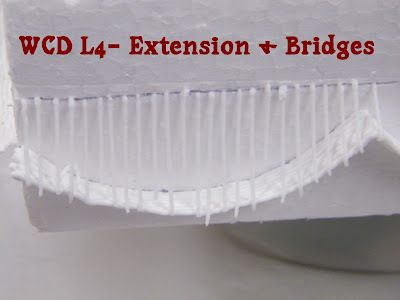 Last week, we did some extension works and bridging. It was rather difficult to pipe as the royal icing was hard, and extensions required at least 7 layers!! Most of us agreed that we will skip this for our project work! Heehee... We also tried our hands on sugar paste frills and flounce and started some carnation modelling. We'll be doing more flowers next week. Yippee! Last weekend, dad gave me a tub of durians. He said the durian "grade" not that good and he didn't want to waste calories on it, so he passed them to me. I took it happily and told him I'll turn them into durian puffs for him. However, when it came to wanting to use the durians, I didn't feel like baking choux pastry. 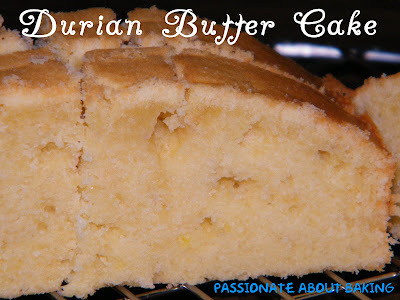 Instead, I baked a Durian Butter Cake from Alex Goh's book. The recipe can also be found in Yochana's blog. 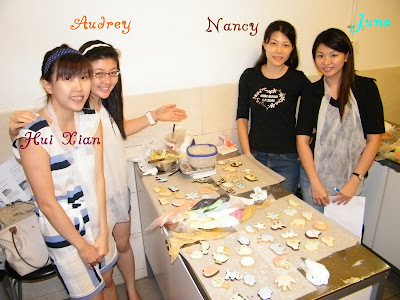 After baking, the durian smell just lingered everywhere. My eldest son couldn't resist it, and kept asking to try. After he finally convinced me that he should try, I pinched a tiny piece for him and he said it was very nice. He requested for more, I pinched another piece. He didn't get to eat more of it until supper time. 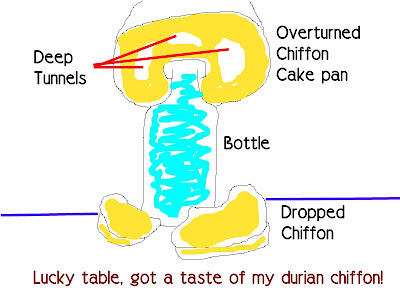 After dinner, I tried to bake another cake - Durian Chiffon Cake by Kevin Chai. The recipe again, can be found in Yochana's blog, though I referred directly from Kevin's book. I didn't think anything was wrong with my batter until I see some cracks on my chiffon. I had replaced coconut milk with fresh milk, and I don't think it was due to this problem. Anyway, after baking, I took out the cake and hung it upside on a bottle. Then my youngest boy came into the kitchen, saw it and commented,"sure drop!" I hushed him and tell him it won't. He repeated it! *Arrrggghh* He has never commented before, but this time he made that comment. One hour later, my daughter ran into the room and exclaimed,"mummy, your cake dropped!" *Arrrggghh* What happened! When I went to the kitchen, the cake really dropped from the pan. Hahaha...It was a pitiful sight of the cake. I regretted not taking any picture of the "crime" scene. However, I attempted to draw it out to share with you how it looked. Below was the scene. Anyway, dispite having a distorted cake, the taste was really nice. The chiffon was really soft even though it cracked and didn't rise too high. The holes were very very tiny. It's either the batter was too watery, or the egg whites were not beaten enough. 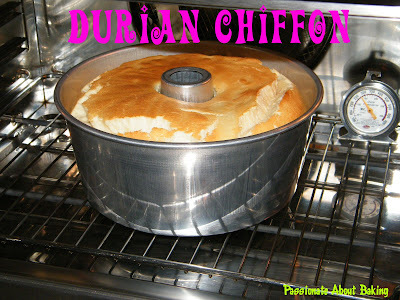 I don't think I have any spare durians to try, therefore, I'll just let this recipe RIP for now. I've started my "Wedding Cake Decoration" course since last week. As there wasn't much done in class, I didn't blog about it. We're told to think of a design for our wedding cake, and that will be our project throughout the duration of the class. 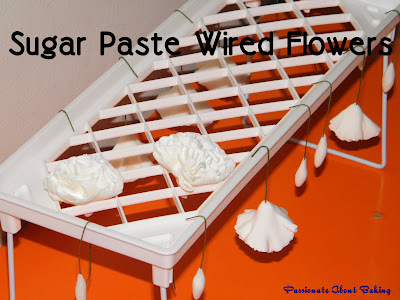 As we moved along, we will make wired flowers, piped laces and many other sugar paste modelling. It does sound fun though. 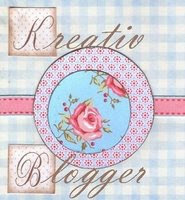 Stay "blogged" to see my final showpiece! Back to my bakings today. I volunteered to make two cakes for my colleague's birthday celebration tomorrow. I baked the cake the day before, frost it, crumb coat it and left it in the fridge overnight. It was exactly what I learnt from Anna's workshop. Seriously, some things we learn, we don't practice, we forget. Other stuff we learn, we practice, and we improved. I must say, hands-on experience works best for me.